Tonsillitis results in the enlargement and inflammation of the tonsils, caused due to bacterial or viral infection. It mostly occurs in children, is contagious and varies from mild to severe. So, it is important for the patients to receive a medical attention as tonsillitis might cause other problems like strep throat. Mentioned here are few natural remedies, which might give a temporary relief but may not cure the problem. 1. Give plenty of rest to your throat and try not to talk. 2. Avoid close contacts with those who are infected with tonsillitis. Maintain a good hygiene. 3. Try to avoid spicy, fried and sour foods that have the tendency to irritate your throat. 4. Gargle with warm water and salt several times daily to reduce the pain and inflammation. 5. Add turmeric and pepper powder to the warm milk and consume it before bed time for soothing effect. 6. Stay hydrated. Have warm clear soups, strained and clear vegetable and fruit juices, green tea, lemon tea that might give a relief. 7. Add 2 tsp of honey, a pinch of salt and freshly squeezed lemon juice to the warm water and sip slowly, which is a traditional home remedy to reduce soreness of throat. 8. Use cinnamon extract which can give a soothing effect to the throat. 9. Use heat pack on the throat region for a better relief. 10. Take pain relievers only after you consult a physician. Interestingly, the practice of yoga and meditation has shown to offer good results. 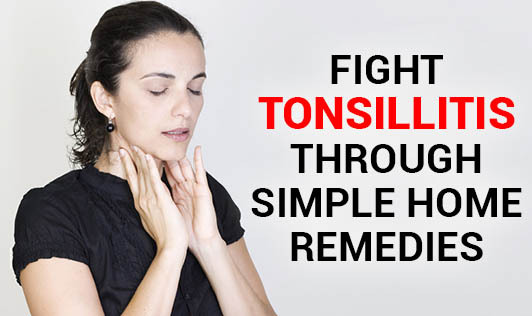 If the tonsillitis is still recurrent then a physician's assistance is recommended!